Microsoft has announced a proactive and personalized troubleshooting experience for customers with the launch of the Fix it Center Online (Beta). You will notice that the Fix it Center Online service, incorporates some of Microsoft’s KB content. Microsoft Fix it Center makes getting support easier than ever because automatic troubleshooters solve the issues you have now and prevent new ones. Fix it Center helps to consolidate the many steps of diagnosing and repairing a problem into an automated tool that does the work for you. 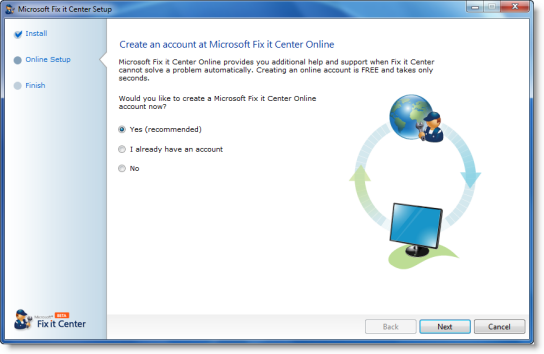 Simply download Fix it Center client and follow the on-screen instructions to complete the installation.